Today, Tiddly Inks is celebrating a wonderful NEW release! We have 10 new release images for you! Some of these fabulous sets will be in clear and all will be in digital form, so you have a huge variety to choose from. The team is celebrating with a hop. Make sure to hit up every blog on the way to see examples of ALL the new releases. Leave a comment on each blog and you will be eligible for some fun prizes. All the prize details will be on your final stop at Christy's blog, Tiddly Inks. The hop will go all weekend (through the 19th at 12am CST) so you have plenty of time to comment and visit each blog. You'll also get to meet all of our new team members! For my card I colored up this fab image with my Copics and paired her with some fun Pink Paislee Halloween papers- I love this green color and it seemed to fit perfectly with the whole idea of the card I had in my head. A few of my fav bits and bobs later my card was complete! The following is the hop list that each member has on her blog. Make sure to go in order so you don't miss anyone and have a fabulous time! LOVE! Very wicked!! Creative with the cheesecloth! Beautiful colouring, and I really love those tiny elements at the top right of the card! Ahhhh wicked, just brilliant, the whole card works just perfect. Super cute, Katie with just a hint of wicked! Love it! This girl's got attitude, super cute. Love your card and the colors are just super. Love the layout and the wicked stamp! Really love her, you have some gorgeous details on your card that really make it pop! wow, Katie! This card is awesome!! Love how you colored this image and those little skulls! And all that texture! Wow! wow! Wow!! 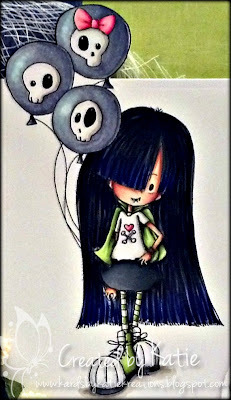 My teenage daughter would also love this image as she love skulls! Love your little goth chick! hiyah Katie!! eep this is so cute! I think those balloons are just so cool!! Gorgeous card!! Tanks for sharing with us!! Great card, and so cute. SUch a cute card!! Love the colors! Adorable card! I love your coloring and the netting is a great touch. The characters have the most adorable faces! so darn cute.. i love it..
Oh Katie, Your card is awesome! Great colors and I love your embellishments! This is a darling card - love the layering. And the hair on your little gal is just gorgeous! Perfect for the teenager... Tiddly Inks rock!! I am a big fan of your coloring.. This is so goth looking...I love it...I have a student just like this! Katie you and your card is awesome! Thank you for the inspiration and the blog hop stop! Ooo, midnight blue hair, I LOVE it! I will have to try that. What a great release! This image is too cute!! Awesome work! What a great card! Love all the elements/texture! Awesome creepie-cutie! Those balloons are hilariously awesome! 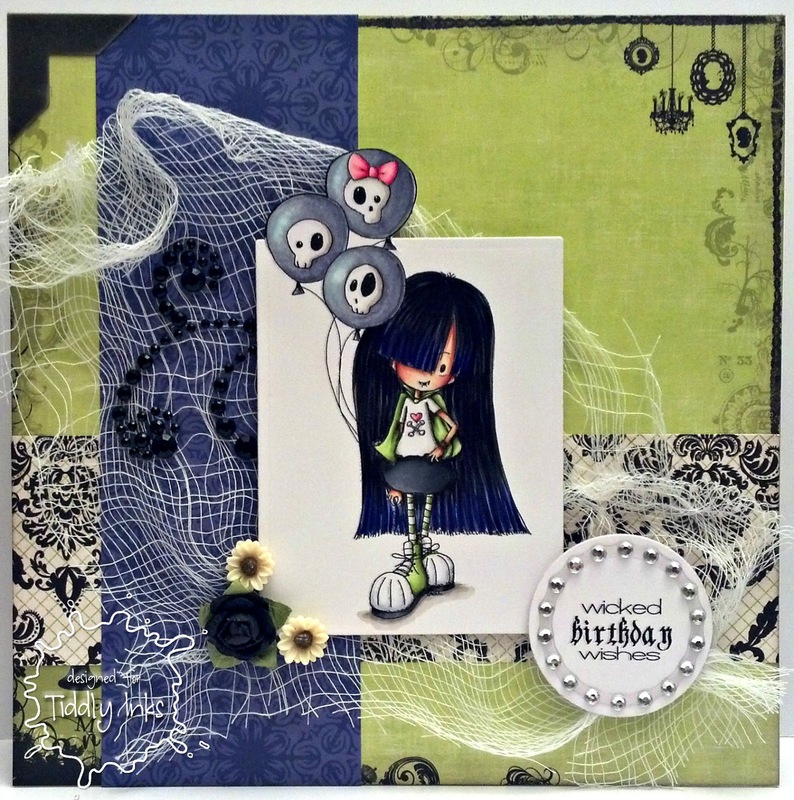 Fabulous - love the material you have used for the cobweb look!! this is totally cute! !loving this spirit of halloween already..I am ready!! love the variety in this release. I like how you combined different colors that perfectly fit the theme of the image. Great job! terrific card, really great layout! Super cute! LOVE the balloons! AWE love your Wicked and cute Bday card!!! Fun papers too! Hey...............this was one of my neighbors when I was a kid.........lol. Nice job on the card. Colors are great together. Love your blue hair...and that webby background is the perfect complement. What a cute card!! I love the colors you used too!!! This is one awesome blog hop!! I love your card, especially how you used the cheesecloth! That cheesecloth is the perfect touch! Great card! Great card! Love the cheesecloth background. Such awesome embellishments. Love the card. Absolutely LOVE how you put blue in her hair! Most people color black hair black, they forget that sometimes there is a blue tint. This card is right up my alley; I love it. Thanks for sharing! this card is so awesome! I saw it on the main page and I just fell in love! the cheese cloth is awesome! Definitely goth and cute! Love the balloons! Gorgeous. Love the spooky feel. Love the balloons! So cute! This is such a perfect b-day card for teenagers!!! Love the details. Creepy creepy. Just love it!! I cant wait to get this image! I love your card. I really like you colored her hair and faded it out at the bottom. Beautiful! She's so creepie and cute! Love all the fun details on your card. Love the mesh behind the image.. it all goes together so well! Really awesome card Katie. Love how you coloured the hair, the blue tones in it are so awesome. Thanks for sharing this fab card. Great card! Love the colors you chose and the mesh in the back! She is truly wicked looking! Love the colors you used!! So adorable...love your coloring and design. How fun is this. Those balloons are great. who wouldn't love this birthday card. everything plays so well with the other elements. great work. Great job and use of the papers, etc.. to compliment the card. Darling card! Love all the embellishments~well put together. Oh she is such a darling. I love how you painted her. She looks young and fresh (lol). these images are so very cute, love how you used the gauze in the background. Your card made me smile....adorable!!! I love the way you colored her, and the colors you picked for her hair is great! so cute and fab coloring! Oh this is cool! I love that cheesecloth accent, the cute little skull balloons she is holding and then the ring of bling around the sentiment - awesome card! So cripie and so cute! Cute creepy card!!! Is there such a thing? Yep!! LOL! cute and creepy, love it. I am looking on the wicked part, but I really find it sooooo cute! I love your card! so lovely.